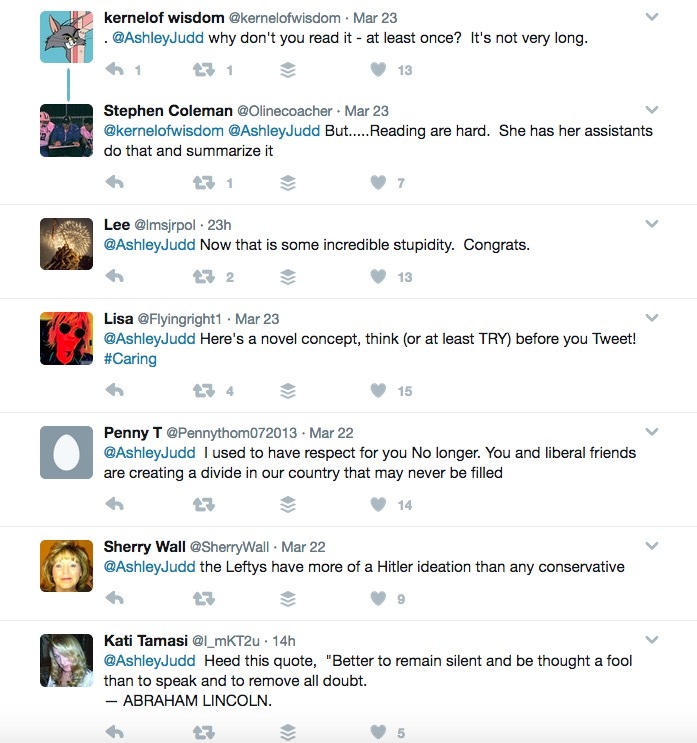 Crazy woman Ashley Judd has been called out for her stupidity once again. You may remember a few months back when she made her infamous “I am a nasty woman” speech. Now that we all are on the same page I think it’s safe we can all agree this woman is bat s%#$ crazy. Fast forward a couple of months and the devil woman is at it again! I’m not sure where she is getting her information but it is most definitely FALSE. She went on to post a second idiotic tweet. Of course, Twitter users were rabid in their attacks on the actress. Some more entertaining than others. Other users noted the 14th Amendment of the Constitution provides equal protection under the law for ALL citizens of the U.S. and the last anyone checked, it applies to women as well. Hollywood celebrities are going off the deep end, and Ashley Judd is topping that list.